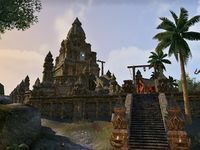 Khenarthi's Roost, the Isle of Three Temples, is a small island off the coast of Elsweyr inhabited by both Khajiit and Maormer, named for the Khajiiti goddess Khenarthi. The island is dotted with moon sugar plantations and is a location of both active Khajiiti worship and Maormer magic, as the Khajiit signed a peace treaty with the Maormer which allowed them to settle on the island. The port city of Mistral can also be found here. According to legend, the hawk goddess Khenarthi rested upon a tree on the island during her first journey across the heavens. This tree would later become the Great Tree, found along the coast west of Mistral. Many of the island's Khajiit therefore worship Khenarthi, although traditional worship of Jone and Jode is also prominent. Khenarthi's Roost is known for the three Khajiiti temples to the Crescent Moons, the Dark Moon, and the Two-Moons Dance. The island is lush with vegetation, and beasts brought by trade vessels from all over Tamriel have come to call Khenarthi's Roost home. Among these creatures are the skeevers of Skyrim, the alits of Morrowind, the thunderbugs of Valenwood, and giant snakes. The rare Pyandonean Ray can be caught off the coasts, and harpies and senche can also be encountered. The island was once ruled by a powerful Maormer mage named Uldor, who used his magic to steal and wear the bodies of his victims, entrapping their spirits forever. Among his victims were a crew of Nord raiders from Windhelm who attempted to loot the island. Uldor was eventually sealed within the Temple of the Mourning Springs along with his victims when the Khajiit created an artifact known as the Mourning Stone. The Khajiit of the island eventually signed the Treaty of Khenarthi's Roost with the Maormer, wherein an Ambassador of King Orgnum would share power with the Mayor of Mistral. The treaty sought to end Maormer piracy in the region in return for fifteen percent of all registry fees and excises. The usually seafaring Maormer would occupy a full-time embassy in Mistral, and the Maormer festival of Serpent's Glory would be celebrated with a feast every year. However, the wording of this treaty unfairly favored the Maormer, and acts of piracy continued. In 2E 580, the first Aldmeri Dominion was formed by an alliance between the Altmer of Summerset and the Bosmer of Valenwood. The Khajiit of Elsweyr were soon invited to join, although the Maormer presence on Khenarthi's Roost delayed the island's membership invitation until 2E 582, when a Dominion delegation was sent to the island. The Dominion quickly began spreading propaganda among the Khajiiti islanders, and each moon sugar plantation came under inspection in an attempt to weed out illegal skooma production and end the smuggling of the island's Crosstree bandit gang. The delegation was headed by the Silvenar Edhelorn and the Green Lady Finoriell, the embodiment of the Bosmer people. However, the Dominion ships were wrecked on the coast by a mysterious storm, and several crewmembers were abducted by the Sea Vipers, Maormer pirates. The Great Tree became infested with kwama after this storm when a trading ship was wrecked nearby, although the tree's spriggan guardians managed to tame the kwama to nurture the tree's roots. Dominion researchers also foolishly removed the Mourning Stone from Uldor's tomb, causing his spirit to briefly plague the island with undead until the temple was resealed. Viewing Khenarthi's Roost as Maormer territorial waters, Ambassador Ulondil was justifiably outraged at the Altmer proposition of the island joining the Dominion. The embassy refused to allow the delegates to view their treaty, forcing Dominion agents to steal it. Once the bias was revealed to Mayor Harrani, the Khajiit began to consider the Dominion's offer. Seeing that all hope was lost, the Maormer assassinated the Silvenar and began a ritual to summon Storm-Slave, a powerful storm atronach, with the intention to destroy Mistral. The Dominion prevented this and drove the Maormer off, allowing the grateful Khajiit to join the alliance. The Maormer paid for their treachery soon afterwards, when the dying Finoriell swam the whole way to Pyandonea and spent her remaining life killing indiscriminately.